I'm not sure exactly what it is, although it's probably switchable diodes or maybe input caps? I'll have a look and see if I can find a scheme. It sounds to me that the clipping is changing so I thought diodes. Knowing which particular ones would speed things up though. You haven't asked before. The Internet so vast and then bumping into people you used to know seems high odds. I'm a Mark as well, from Luton and still (sometimes unfortunately) live there. The right one? It may be worth just adding a 3 position DPDT clipping switch with silicon one side, LEDs or germanium the other and the centre position would be a diode lift clean boost setting. Thanks for the modded layout addition. I think I'm considering a rotary switch similar to the DAM Ezekiel 25-17 with lots of options. How would you consider the best way of doing this? A little daughter board? Or even easier, use a 6 position double pole switch, solder the diode pairs across the switched lugs (using the pair that are switched simultaneously in each position such as 1 & 7, 2 & 8 etc), and then just take the two commons to the board. Hmm, the sparkle drive! Was it the OCD that was done from this one or? Will prob do this during the weekend! Thanks mark as always! 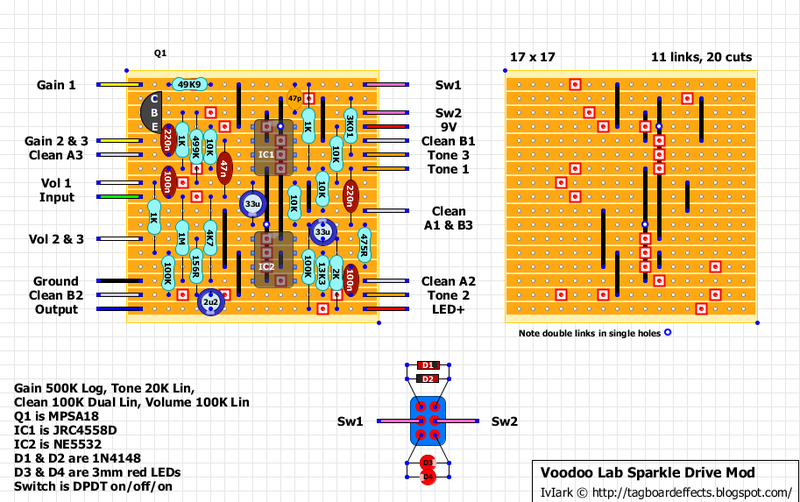 No that's the Voodoo Lab Overdrive, there's a layout on here for that too. thanks for posting this one Mark. i'm going to try and build it this weekend. I've been offered a pack of AA143 germanium diodes at a very good price on my local store. Don't know very much about them, just that they are used mainly as am/fm detectors and have a low voltage drop between 0,29 and 0,33, maximum 0,50v at 15 mA. Would be of use in this kind of circuits / stompboxes? Thank you! Yes they'd be useful in a lot of things, anything that has germanium diodes could use them, or you could also experiment with replacing silicon diodes in any of these layouts or maybe putting in a diode switch to choose between silicon or germanium. It's always worth getting anything in like that. So, tomorrow afternoon will go to the store and get it. I've been offered a pack of 100 units at 5 cents each (NOS, but I wanted to be sure first that they would be of any use. I would like to post the schematics along with the layout, but unfortunately they're not my property to share and so I may not have permission to post them. 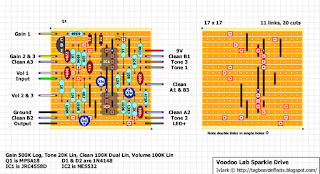 But with very few exceptions, the layouts I do are based on schematics found at freestompboxes.org, and so you can get them from there if you do a search including this one. i used the schematic along with Brian Wampler's recommendations for modding a tubescreamer so that mine will work a bit better with my basses. just about every mod for a TS808 will apply to this pedal. I Just tested mine and it works PERFECT so you can verify this one Mark. the only thing you'll want to correct on it is that GAIN 3 should go to GAIN 1, and GAIN 1&2 should go to GAIN 2&3 so that the gain is increased as you turn the control clockwise. i used a 1M audio pot on mine to give it a little more gain (distortion), but the A500K works well too. Hi John. How would you say this compares on bass with the DAM Ezekiel 25-17? IMO, they're two completely different sounding pedals. to me, the sparkledrive is smoother. i modded my sparkledrive more to my liking for use with a bass. by changing a few caps, adding more bottom end and flatter mids, and extended transparent highs. the nice thing is, with the three clipping options, i can still have plenty of mids if i want it. here's a couple of pics of my Sparkle Drive build (modded for bass). IMO, this is an awesome sounding pedal! Thanks for posting it Mark! Excellent, thanks for these and the Fuzz Head pics John. Great job as usual. Great looking build John. HOW have the two (looks like from pic) 330n caps made the pedal better for bass from stock? i really think that raising the values of the caps helped it ALOT. when i want an overdrive for use with a bass, it has to maintain the low end and i found the stock circuit to be just a litte bit lacking in that respect. Hey John, a dumb question maybe: How do you make the stickers for your pedals? What do you print them on and how? i use a brother P-touch 2100 and use the software to make them. or of course a mix of the two if the Clean pot is set somewhere in the middle. So if your dirt side seems to be working ok (and assuming the Clean pot is wired up correctly) the problem will most likely be around the right hand side of IC2. Either the link between pins 6 and 7 under the IC, the 13K3 resistor from pin 7, or the link on the left hand side of IC2 going up from the bottom of the 13K3 to pin 2 and the 100K on the same row. Check for an unwanted bridge somewhere around there, or maybe a cold solder joint or something. thanks very much for the advice, its working great now, i realised im an idiot and used the wrong resistors, put 15k's in insted of 10k's. should have read the colour coding rather than trusting the makings on the box i took them out of! now moving on to the biff muff civil war. Whats the 3k01 resistor, is it supposed to be 3k1? Or is it a 3010R resistor? it would be a 3010R but a 3K is fine. Built this today. Great sounding crisp od. Thanks for the layout Mark! Im just starting to stock up on parts to build this one. Theres a few uncommon resistor values and i was wondering how important it is to be exact or can i round up some of them or are a few of them important to be the specified value? I don't think any of them are particularly important. A lot of builders seem to use unusual values but every time I've compared the difference between something like a 4K7 and a 4K99 I haven't noticed anything more discernible than usual differences in tolerance. And as this is all subjective who's to say that the value used provides the best sound anyway? Maybe with your gear a 4K7 would sound marginally better that the stock value. Just use the closest value you have and don't worry too much about the minutiae. Otherwise for this pedal, Q1 is the transistor - an MPSA18 and it's the same as the CBE componenet, CBE just refers to which leg of the transistor is which. For the capacitors I'd use polybox ones, resistors I'd go for Metal Film and the diodes are 1n4148's. The only stuff you won't be able to get from a regular electronics store are: IC1 which you can probably use a TL072 for and Q1 which you could use a 2n5088 for. Hope this helps. thanks mate, I'm gonna try a simple boost and then a ts808 first, but this is the pedal I really want to build. I have got most of the parts, but I cant find 49k9 and 3k01 resistors. am i correct in saying that they are 49.9 k ohms and 3.01 k ohms respectively? i just cant seem to find any online that are exactly those values. would a 50k and a 3k work fine? Yup. Just use the closest values - I bet you don't hear anything different. Anyone compared the sound from one of these builds side by side with a real one? - how close is it? I can't seem to source the NE55532 - is there an equivalent? That list fo op-amps.....are they all pin compatible? - so you can just drop them in to any of the circuits? Thanks for the list - that's really helpful. Would using a 200k clean knob be the end of the world? No I think that would be fine. Awesome, I was all stoked to build this and then saw that I had no dual gang pots, then saw the 200k and thought I would ask. Seems like a great pedal for bass players! On the dual pot, is A the group of tabs closer or further away from the shaft? It doesn't really matter which set is a or b, the key thing is to make sure all the b's are on the same set of lugs and the same with the a's. The reason it doesn't matter is that essentially the same thing is happening simultaneously on each set of lugs so it doesn't matter which set you use for a or b. One more question, if I wanted to add tantalums for the .22mf caps, how should I orient them? Yeah! I have indeed convinced my bass player and built one for him, including John Kallas' mods. How do I modify this pedal to TS-808 specs? 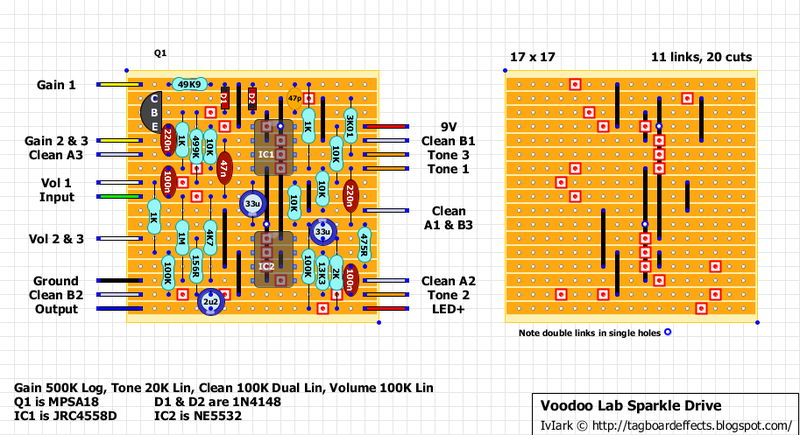 According to singlecoil.com (http://www.singlecoil.com/docs/tubescreamer.pdf), I just need to have the proper IC chip, which the vero board layout already has shown. Then I need to change two of the output resistors to preferably 5% comp resisters but which two? 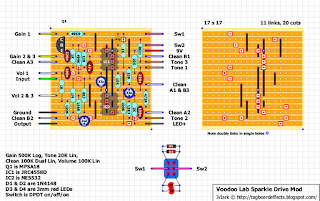 I changed the 475R to 100R and the 100K, near the 475R resistor, to 10K. It definitely does sound warmer and rounder in the bass but I just wanted to check with all of you guys to see if I'm right. Thanks guys! Can someone post a board that can be added on to an existing ts type circuit to replicate the blend function of the sparkle drive? I've added a poodle parts blender to an overdrive, but instead of a buffer I'd like it to be a jet boost that has a shared volume control with the overdrive. Built this and it's very nice. A much better Tubescreamer in my opinion and a very good, transparent clean boost when set to clean. I might try a reverse taper for the tone though as it seems to bunch up a little at the end of the rotation. Can I use tantalum caps for 47n,220n and100n? If so which way to insert for positive leg? LED+ connects to the LED anode, the cathode then goes to the stomp where it is switched to ground to turn it on. Hi pedal still not working. It now makes like a crackling noise when i strum really hard. I can hear the signal but it breaks up quite heavilly and is faint. What can cause this? Is the signal loud on the Volume 3 lug and quiet on the Volume 2 lug? Hey Mark, the 'Vol 2&3' are both a lot quieter than the Clean A3, B2, A2 and B1. The Clean control seems to work properly, but something is happening after that that is attenuating the signal somehow..! My IC voltages all seem ok, if that's any help. Is the sound quiet at pin 2 of IC2? Yeah I'm getting no signal at IC2 pin 2 or 3, and clean signal on IC2 pin 5, 6 and 7. Hm. Dang, I don't know what I did but it works. Lol. I LOVE YOU GUYS. LED＋ on the board means anode of an indicater LED……??? yeap that's right. it helps you know when the effect is on and off. i always link indicaters to DC jacks directly.